When I heard about the first cat cafe opening in Austin, I thought of all the blog posts I’d read about businesses in Japan where people could sit and relax with resident cafe cats. The accompanying pictures depicted cozy utopias for cat lovers, and I couldn’t wait to join in. With my next thought, worry crept into my mind. Cats are notoriously particular and many don’t want anything to do with other cats. Would our Austin business be run by people who would keep that idea, along with the importance of cleanliness, in mind? And what about litter boxes?! 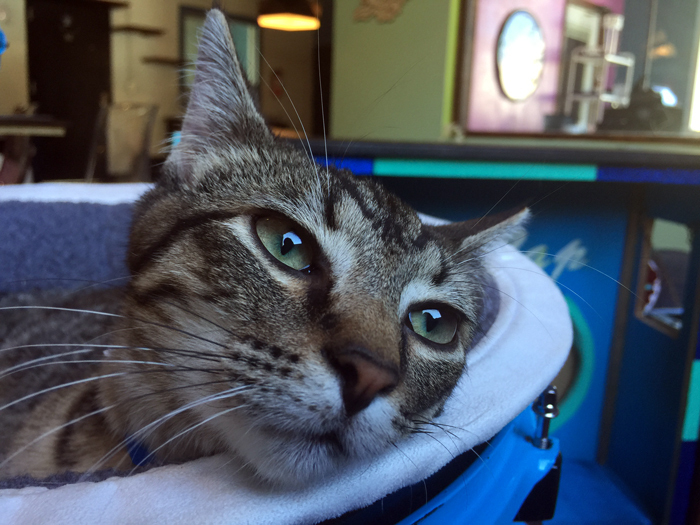 To talk about the welfare of the animals at Blue Cat Cafe and the business itself, I met with founder and co-owner, Rebecca Gray, and co-owner and technology mastermind, Jacques Casimir, the week before the cafe opened to the public. The entrance to Blue Cat Cafe is divided from the rest of the cafe, to ensure no cats can bolt out the door onto the busy street. Once inside the large open room, I saw the design influence of Cat Style Expert, Kate Benjamin. Benjamin works closely with Animal Planet’s “My Cat From Hell” star, Jackson Galaxy, to write books and help with “catification.” This term describes curating a place where humans and cats can live peacefully, benefitting from the room. The design technique includes putting “superhighways” along the tops of the walls, so cats can access different levels to escape people and each other, and get some jumping exercise. 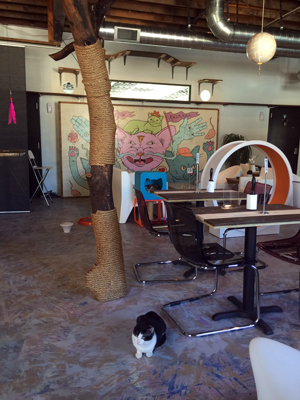 Feline-inspired artwork, toys, cat-friendly furniture and food bowls are sprinkled throughout Blue Cat Cafe. The feeding stations will eventually open only when a cat’s microchip is detected. This will help keep dust and cat food smells away. This isn’t the only technology that will be up and running soon. Casimir is building a system that will help with their “roll call” routine every morning and evening. Cats are great at hiding, so instead of employees searching high and low, they will be able to scan the building and immediately see the location of each cat. I noticed that the aroma of the building was as fresh as outside. No smells hung in the air, and Casimir even showed me the Litter Room. The boxes were immaculate. While he explained the high-tech ventilation system, I noticed the cat-sized entrances at the top and bottom of the wall. I really appreciated Casimir’s planning when it came to these elements that could instantly make the space unpleasant. Little Girl hopped in a cushioned guitar case to play. Collars mean the cat is adoptable. Each cat has a microchip and all of their shots provided by the Austin Humane Society. Microchips can be scanned if a cat gets lost. All cats are spayed or neutered. Gray and Casimir talked about their business with pride and enthusiasm, but also with a shared calm cats respond favorably to. After our chat, I hung around for another hour, trying to coax the cats into becoming my friends. For every cat you see at Blue Cat Cafe, there are probably two or three off sleeping somewhere. At the time of my visit, there were nine cats in the cafe, but they have capacity for around twenty. The Austin Humane Society pre-selects cats after they have been monitored to determine their personality types. 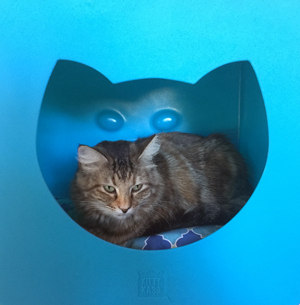 Even then, the employees at Blue Cat Cafe keep a close eye on each cat, to make sure none are too aggressive or timid to get along in the cafe setting. The goal is for each cat to be adopted into a loving home. It’s a one-stop process, as kitties can be taken home directly from the cafe in a carrier box. Food, the cat’s favorite toys, a scratching post and a bed can be purchased, as well. 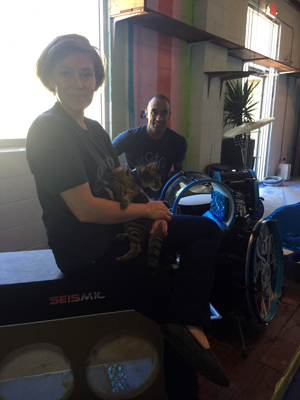 Employees will inform perspective adoptive families of the cat’s usual behaviors. They can let people know if Frank, a small tabby, is just having a calm day and is known to tear across the room at lightning speed. James Clark, Solomon Perry and Brian Maclaskey created the psychedelic cat artwork outside and inside the space. 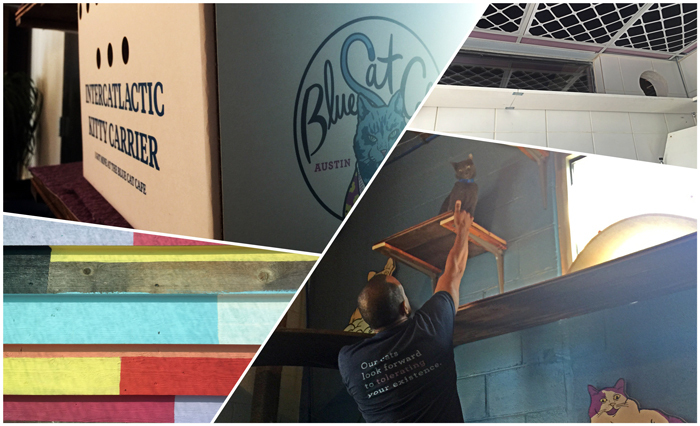 Blue Cat Cafe is located at 95 Navasota Road in Austin. Check their Facebook, website and this fun and informative video for hours of operation and answers to other questions you may have. Their capacity for people is capped at 40, but no reservations are required. Entry is $5 for unlimited time. They eventually plan on hosting events like speed dating, kitty yoga (the cats already have their own mats) and art night. 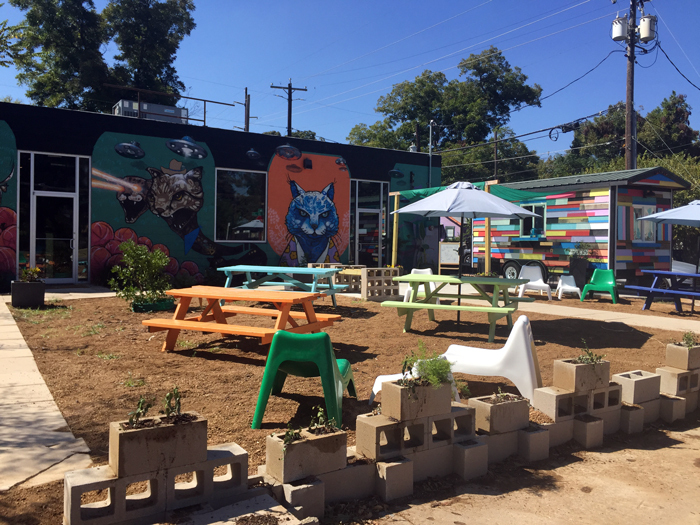 All of Blue Cat Cafe’s vegan-friendly food (sandwiches, tacos, nachos) is prepared outside in a trailer. You can choose to eat outside or bring your food inside. Lattes, espressos, cappuccinos and teas are also available. As I was researching and writing this article, protests took place at Blue Cat Cafe. Protestors feel the cafe supports the wrongdoings of the landowners, wrongdoings which should not be forgotten. The site of the cafe’s parking lot was once Jumpolin, a small business that was demolished with all of their inventory still inside. Blue Cat Cafe has the potential to be a family-friendly space on a street where many bars are popping up. It also has the potential to find homes for hundreds of animals. 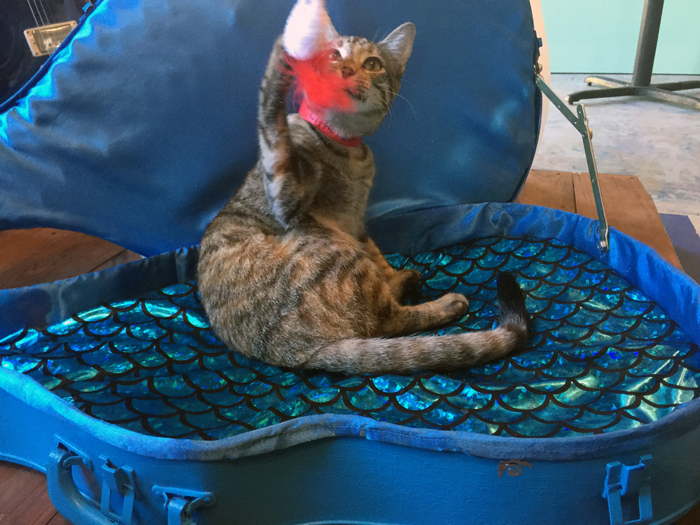 Frank has already been adopted, along with three other kitties, and patrons have high hopes that Blue Cat Cafe will develop into a positive community space as it establishes itself as a new small business in Austin. Have you ever adopted a cat in Austin?